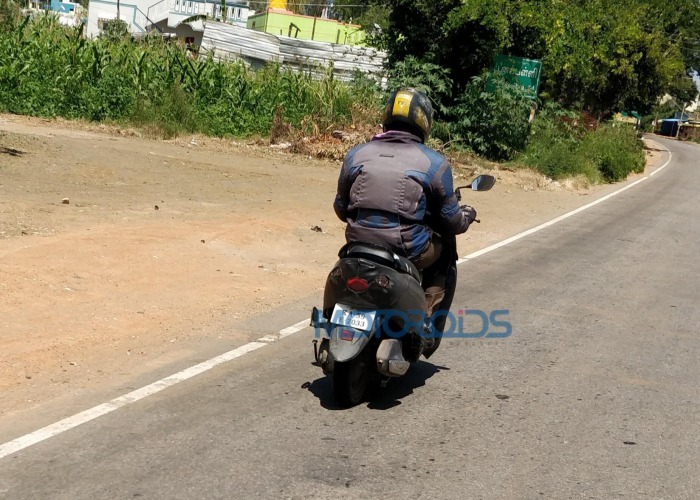 A test mule of the 2019 TVS Wego 110 was captured in its pre-production avatar by Motoroids reader Abhilash Mishra. The scooter was heavily camouflaged and just the right rear quarter of the vehicle was visible in the spy photographs. Thus, the details are scarce at the moment. Heavy camouflage concealed most of the details but the test mule revealed the alloy wheels design and the tail light setup. As seen in the images, the scooter will feature an identical exhaust outlet as the current model. The tail section was partially visible, revealing the red cover for the brake light and transparent screen for the blinkers – a setup that is also seen on the current generation model. That said, the pillion grab-rail is different from what is seen on the scooter in its existing form. Motoroids reports that the scooter was not equipped with LED headlight. 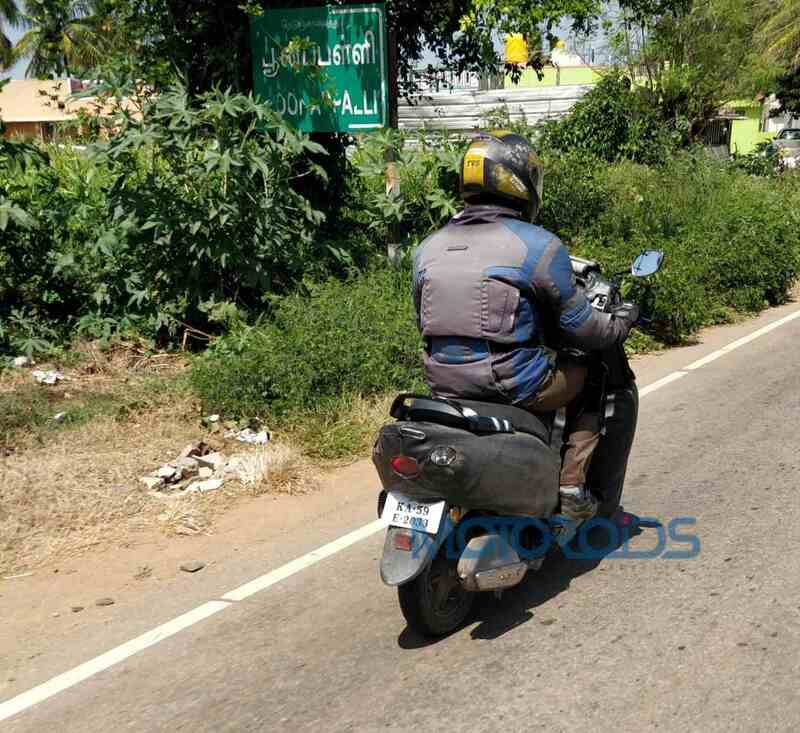 The photographs also reveal the alloy wheel design, which is identical to the units on the current Wego. Expect the new model to use the same 12-inch wheels, wrapped in 90/90-section tubeless tyres on both ends. What should you expect from the 2019 TVS Wego? Starting from April 2019, new safety norms make the combi-braking system mandatory on all two-wheelers below 125cc displacement. Thus, we expect to see the company's proprietary Synchronized Braking Technology (SBT) on the new Wego. TVS may also be testing the new BS-VI ready motor on the test mule as the emission norms would come into effect from 2020. The current model uses a 109.7cc 4 Stroke, Single-Cylinder, air-cooled, Spark Ignition that is tuned to deliver 8 PS of maximum power at 7,500 rpm and 8.4 Nm of peak torque at 5,500 rpm. Stopping power comes from 130cc drum brakes on both ends while a 220 single disc at the front is also available for a premium price. Suspension duties are performed by telescopic forks at the front and unit swing, gas-filled hydraulic damper at the rear and that setup will most likely be retained on the next-generation model. The scooter will continue to use duplex tubular frame and most likely feature near identical dimensions as the current Wego 110. The 110cc offering from TVS is 1,834 mm long, 640 mm wide and 1,115 mm tall. The wheelbase stands at 1,275 mm while the fuel carrying capacity is 5-litres. The 2019 Wego still seems to be some time away from being production ready. Expect the new model to arrive with Synchronized Braking Technology on the market in H1 2019. Meanwhile, TVS Motor Company launched the Jupiter Grande in India at INR 55,936 for the drum variant and at INR 59,648 for the front disc variant (prices are ex-showroom, Delhi). The new Jupiter Grande benefits from a full-LED headlight and a semi-digital instrument console.